With summer looming (slowly!) I've started looking for gifts to present to my daughters' teachers for the end of the school year and for my family and friends with Ramadaan and 'Eid around the corner. Not everyone likes makeup the way that I do and so it calls for broadening my search and coming up with ideas and gifts that will make someone smile on any occasion. 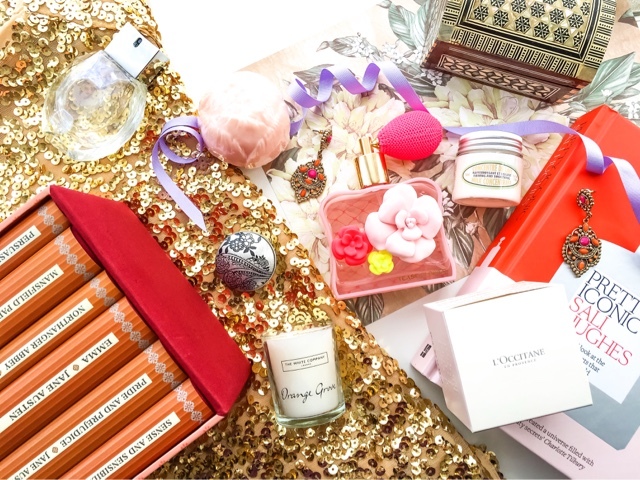 Here are some summer gift ideas for friends, family and colleagues from luxurious body pampering, home fragrance, a tailored advent calendar and personalised goodies. Gift giving is a huge part of celebrating throughout the holy month of Ramadaan and especially for the day of 'Eid so I am super impressed to see The Body Shop create a dedicated line of gift sets for the occasion. The Body Shop Ramadan & Eid Gift Sets features the incredible Eid Treats Collection which is a 30 day advent calendar, said to contain 30 full size products, though I am struggling to find details of where to purchase it from. There is also a range of smaller gift sets decorated with geometrical designs in the style of Islamic art. Any of these gifts would be great for friends or colleagues celebrating the holy month or for 'Eid and the super cute tailored touch would make it all the more memorable. For someone in your life who loves books and reading, Penguin Clothbound Classics is a great option. It doesn't matter if they've read Jane Eyre or Great Expectations a million times, they will love to be on the receiving end of these gorgeously bound and decorated collectors' editions of these classics. I know how much I cherish my Jane Austen book set which my sister kindly gifted me after the birth of my second daughter. It doesn't matter that they're too pretty to read, I love them and I know any book lover would appreciate a gift like this. I don't think you can ever go wrong with personalised gifts because they have the recipient's name on them so of course it's perfect for them. There really is no limit to what items you can have personalised these days but my favourite pick is one that anybody would appreciate, because who can say no to some chocolate eh? Personalised Cadbury's Chocolates offers you the chance to choose which size bar or box you want and what message you'd like printed on the box. It's bound to make anyone happy seeing their name and a loving message on the nation's favourite chocolate. Also, a cute addition to any of the aforementioned gifts could be a Personalised Vaseline Tin. We all have them in our handbags or bathroom cabinets and I think its a small but cute item that would accompany any gift perfectly. *This is a sponsored post. All opinions are my own and 100% honest. See my Disclaimers for more information.